Research indicates that nearly 80% of unscheduled equipment downtime is due to operator error and preventable. 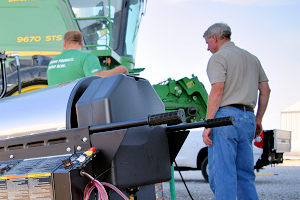 Statistics like that show how important operator training is when it comes to your equipment. If equipment operators are not proficient in the care and use of your equipment, your company runs the risk of accidents involving equipment damage and operator injury. Washer Systems of Iowa includes operator training with the sale of every piece of equipment. Your company or operation may need to schedule additional operator training from time to time because of employee turn over, the addition of new equipment, or to comply with new safety regulations. There are many other reason why you may need to schedule operator training for your pressure washer, waste oil heater, or floor care equipment. Make sure your operators and equipment are protected with solid training. You can schedule or request training any time by filliing out and submitting the form on the right. Our expert staff will contact you within 24 hours. Give us a call, or stop by and meet our staff and we can answer your questions about the operator training program.